Cheap and Easy Family Fun! Spend 20 minutes each week passing on your faith and values to your children. I know we all –myself included– have the best intentions, but get washed away in the flood of “to-do’s”, don’t we?! No longer! I have the solution: just buy a few bags of marshmallows, and each week I’ll provide the fun and good lesson to tie it all in. All you have to do is smile, have fun with your kids, and talk to them as you do it. Sounds do-able, doesn’t it? Stop at the store on your way home today and pick up some marshmallows and toothpicks. This time you’ll need the big ones. You will need enough marshmallows for either pairs or individuals to each have about 25 of them, so get the big bag! Two packs of toothpicks will be plenty. You’re going to set a timer for 5 minutes and build towers using big marshmallows and toothpicks. Yup, that’s it. The first time everybody can try building the tallest towers. It doesn’t have to be the prettiest or even stay up very long, but it does need to stand when the timer goes off. Now take it all apart and do it again, but this time the goal is to have the sturdiest tower. After another 5 minutes, Congratulate the builder of the least wobbly tower. They probably aren’t as tall this time. I bet the winner focused on having a well built structure, paying closer attention to the base then its height. Ask your kids why it might be good to think ahead? Did they think ahead when they planned their towers? If not, did they fall down quickly? If they did think ahead, did it pay off? If the discussion is going well, you might talk about some times when you did or didn’t plan ahead and the results that ensued.If your kids are starting to get that glazed look in their eyes, wrap it up as quickly as possible. There will be another time-next week, in fact! Now have some fun with your kids! And don’t forget to pat yourself on the back! 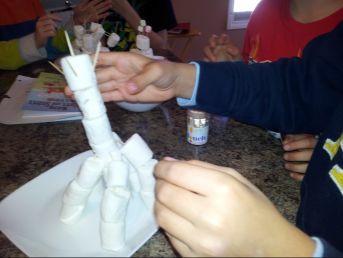 Check back next week for another great idea to parent on purpose with marshmallows!